Rimban Hiroshi Abiko of Los Angeles Hompa Hongwanji Buddhist Temple leads an outdoor prayer service for the victims of the earthquake/tsunami. Attendees gave incense and flower offerings. 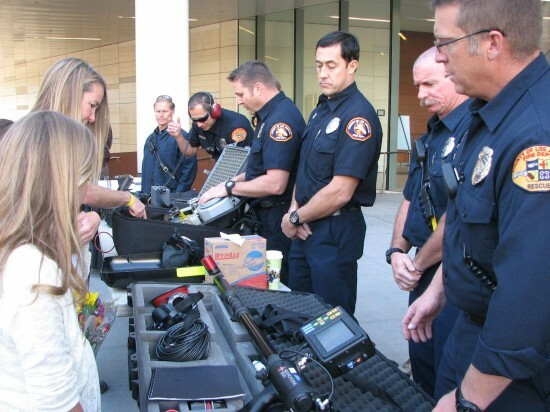 The Los Angeles County Fire Department’s Urban Search and Rescue Team displayed equipment used to find survivors after a disaster. Attendees were asked to write messages of encouragement to the people of Tohoku. 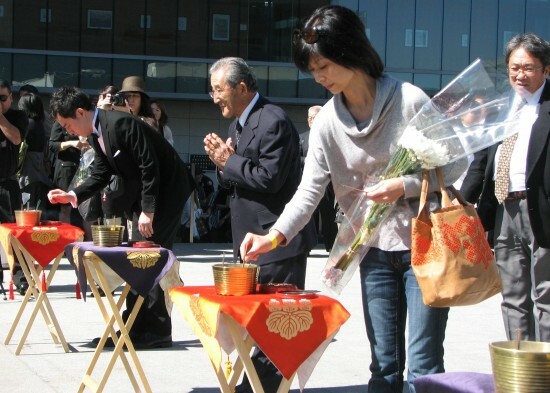 The second anniversary of the earthquake and tsunami that devastated northeastern Japan was observed Sunday at LAPD Headquarters near Little Tokyo with a ceremony and a discussion of lessons learned from the disaster. 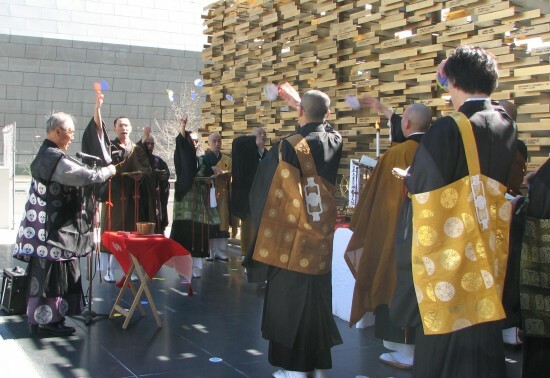 Co-presented by the Love to Nippon Project, Japan America Society of Southern California, and Nichi Bei Fujin Kai, the event began in the plaza with an ecumenical service and prayers, led by Rimban Hiroshi Abiko of Nishi Hongwanji Los Angeles Betsuin and Rev. Mark Nakagawa of Centenary United Methodist Church. Well-wishers lined up to offer incense and flowers in memory of the nearly 16,000 lives lost. Outdoor displays by local groups, including the Miyagi, Iwate and Fukushima kenjinkai, offered information on how to help the victims as well as how to prepare for natural disasters in California. Attendees were asked to write messages of encouragement for the people in Tohoku. The Rescue Dog Association of Japan was also represented. Organizers hope to establish March 11 as an official day of emergency preparedness in Los Angeles. 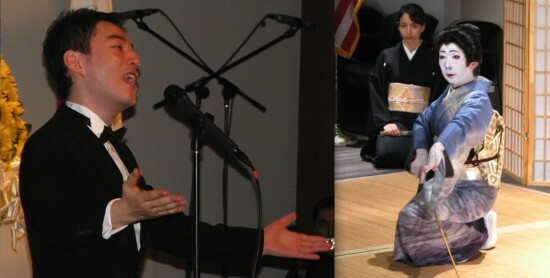 The main program, held in the Ronald F. Deaton Civic Auditorium, was emceed by Janet LeBlanc and Jennifer Usyak and opened with the national anthems of Japan and the U.S., performed by 2011 Nisei Week Queen Erika Olsen and the Holiness Youth Choir, which traveled to Tohoku and other regions of Japan last year. There was a moment of silence for the dead, the missing and the survivors. Cantor Seth Ettinger sang a memorial prayer from the Jewish faith. JASSC President Doug Erber talked about the 2011 Japan Relief Fund, which was established immediately after the earthquake and has raised nearly $1.5 million, all of which has been sent to Japan. With the Japan Society of Boston, JASSC also donated instruments to the Kamaishi Civic Wind Ensemble, which had lost everything. “This was seen as a real morale booster for the entire region of northern Iwate,” Erber said. 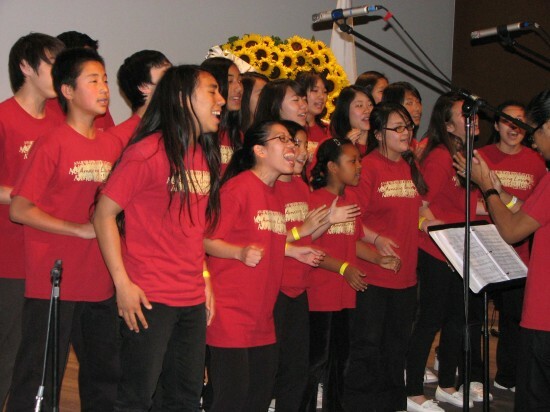 The Orange County Friendship Choir sang “Hana wa Saku” (Flowers Are Blooming), commissioned by Japan’s NHK network and written by Sendai native Shunji Iwai to support the people of Tohoku. The choir also performed “Furusato” (My Hometown). Two members of the Los Angeles County Fire Department’s Urban Search and Rescue Team recalled their experiences in Japan immediately after the tsunami. The team also helped victims of the Indian Ocean tsunami, Hurricane Katrina and the Haiti earthquake, and had just gotten back from quake-stricken Christchurch, New Zealand when they were called to Japan. Assistant Fire Chief David Stone said that the Japan quake was notable not only for its magnitude, 9.0, but also for its duration, about 6 minutes, and the height of the tsunami that followed, which peaked at 133 feet. From its facility in Pacoima, the team arrived at Misawa Air Force Base, consulted with the U.S. ambassador to Japan and the Japanese government, and established a base of operations at an elementary school in Sendai. They were joined by another U.S. team from Fairfax, Va., and a team from the U.K. This self-sacrifice exemplified “what we found in Japan in terms of people looking out for each other, total strangers helping total strangers … I saw the same thing in the Kobe earthquake in 1995,” he said. Teri Lee Hirano, representing the Marina Del Rey community, said that her first experience with a natural disaster was the Sylmar quake of 1971, which prompted evacuations and school closures. Growing up in San Fernando Valley, her idea of emergency supplies was items like hair spray and nail polish, but living through the 1994 Northridge quake caused her to become more practical. Hirano is also working on an emergency plan for her community, including helping senior and the disabled, and urging pet owners to get ID tags and microchips in case their animals run away. Love to Nippon founder Masako Unoura Tanaka, who survived the tsunami, told family members to establish a meeting place in the event they are separated during a disaster. “When you go home tonight, you discuss about that, please,” she said. Her husband, Ted, said that the couple’s meeting place is the Westchester Golf Course. Unoura Tanaka said that she was saved by a member of the Japan Coast Guard. Having heard that the tsunami had already hit Kessenuma Port and was fast approaching, he led her and her aunt to the top of a nearby building. The program concluded with a video by Darrell Miho and Ken Matsui of the Ai Love Japan project; Yusuke Tominaga, a singer and composer from Fukuoka Prefecture, who performed “Himawari no Hana” (Sunflower) and “Arigato”; and a lively gospel number by the Holiness Youth Choir. 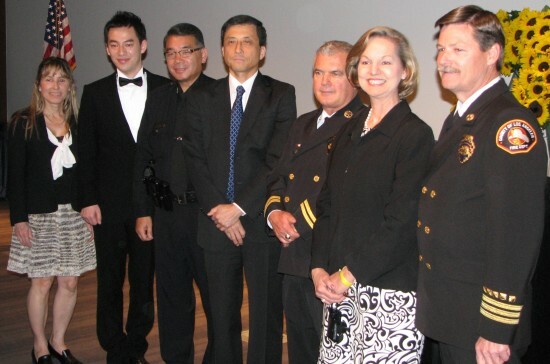 From left: Toby Mallen, Nichi Bei Fujin Kai; singer Yusuke Tominaga; Terry Hara, LAPD; Consul General Jun Niimi; Larry Collins, L.A. County Fire Department; Lori Gardea, Nichi Bei Fujin Kai; David Stone, L.A. County Fire Department. The Holiness Youth Choir opened and closed the program. Left: Janet LeBlanc and Jennifer Usyak served as emcees. Right: Cantor Seth Ettinger (pictured) and Rev. Ken Yabuki of Union Church gave the convocation. From left: Doug Erber, Japan America Society of Southern California; Teri Lee Hirano of Marina Del Rey; Masako Unoura Tanaka, tsunami survivor and founder of Love to Nippon Project.